Coolsculpting is a non surgical fat removal procedure that works by freezing fat cells. No downtime, pain free, no anesthetic. Featured on The Doctors, Dr. Oz and other national shows. Different than SmartLipo and LipoSuction. Spa 35 is a Medical Spa with Expertise in CoolSculpting (compare to SmartLipo), IPL (Intense-Pulsed-Light), Laser Hair Removal, Botox, Juvederm, Voluma, Obagi Skin Care. See Dr. Michael Bailey, Cosmetic Surgeon, in our building for SmartLipo and LipoSuction. Serving Boise Meridian Eagle Sun Valley Southeast Downtown Idaho, Spa Thirty Five. Non-Invasive Fat Reduction* with CoolSculpting®. Spa 35® Med Spa is the #1 Provider of CoolSculpting® Fat Reduction in Idaho and the Only CoolSculpting® Master Certified in the State! CoolSculpting treatments are fast with little or no discomfort and no downtime! DualSculpting At Spa 35®, the simultaneous use of two CoolSculpting machines for the fastest fat removal possible! CoolSculpting Fat Reduction Stories. Below are short videos by CoolSculpting users. Say goodbye to muffin tops, love handles and belly fat ("pooch")*. Remove fat cells non-invasively (no knives or anesthesia) with no downtime. ** Find Dr. Stevens on the television series "The Doctors". Dr. Grant Stevens provides CoolSculpting for patients interested in a non-surgical alternative to Liposuction. CoolSculpting is an effective fat freezing procedure. 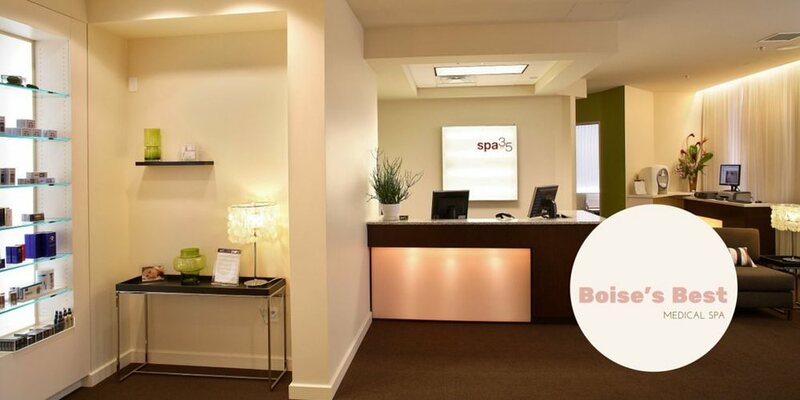 We Love Our Clients, Look At What They Say About Their Experiences At Spa 35! Industry Leadership - Warren Danforth, the Spa 35® owner, is a Key Opinion Leader for Syneron-Candela's Medical Spa Program. Syneron-Candela® is a global non-surgical aesthetic device company and the maker of Profound®, Intima® and CO2RE®. *Resuls Vary ** CoolSculpting expert Dr. Grant Stevens provides information about the latest fat-freezing applicator - the CoolSculpting Advantage. Now you can freeze the fat in half the time as before, and still get the same great results! ***See Clinical Studies for documentation on how CoolSculpting removes up to 25% of fat cells. CoolSculpting® is the coolest, most innovative, non-surgical way to lose those annoying bumps and bulges of stubborn fat*. This revolutionary technology removes targeted fat cells in the treatment area to produce a noticeable, natural-looking reduction in fat bulges. *Results Vary ** CoolSculpting on CBS News. Hundreds of thousands of people undergo liposuction each year, but this relatively new treatment claims to slim you down half an inch after an hour of treatment. Vinita Nair reports on how effectively this procedure works. The CoolSculpting procedure reduces stubborn fat cells safely and effectively, without surgery or downtime*. This fat reduction treatment is the only FDA-cleared procedure to use controlled cooling to safely target and eliminate diet- and exercise-resistant fat. CoolSculpting results are proven and noticeable , so you'll look and feel great from every angle. Diet and exercise will influence your results. CoolSculpting destroys fat cells. But, if you eat more calories than you burn remaining fat cells will get larger. Freeze away fat? It comes down to science. Fat cells freeze at higher temperatures than surrounding tissues. CoolSculpting technology safely delivers precisely controlled cooling to gently and effectively target the fat cells underneath the skin. The treated fat cells are crystallized (frozen), and then die. Over time, your body naturally processes the fat and eliminates these dead cells. The Spa 35® team will develop a customized CoolSculpting treatment plan that addresses your problem areas. Additional sessions may further enhance your results. Your individualized treatment plan will be tailored to your body, your goals, and your budget. It’s easy to sit back, relax and let the CoolSculpting device do the work. After we select the area(s) to be treated, the device is positioned on your body and controlled cooling is applied. *Results vary. Reviews are written by, and are expressions of Spa 35 customers. Their exceptional results and experiences at Spa 35 Med Spa may not be representative of your experince at Spa 35. ** Helena decided to have CoolSculpting to reduce the diet- and exercise-resistant fat on her abdomen. She shares her motivations, her treatment experience, her great results, and how she now feels about her appearance. *Results vary. The outstanding experiences referenced by Spa 35 customers in their five star reviews of Spa 35 are the opinion of the customer and may not be representative of the results or experience you will receive at Spa 35 Med Spa. CoolSculpting Question: Am I a good candidate? CoolSculpting Question: Can men lose fat from CoolSculpting? CoolSculpting Question: How much does CoolSculpting fat removal cost? ANSWER: The price for CoolSculpting procedures varies depending on your areas of concern, the number of sessions needed, and your ultimate goals. We will help create a customized treatment plan, in person, that’s tailored to your body, your goals, and your budget. The minimum amount would be about $800 depending upon current promotions. CoolSculpting Question; How long is each session? How many sessions will I need? ANSWER: Most sessions are 35 minutes of treatment time. This doesn't include paperwork and prep work. We will help you create an individualized treatment plan tailored to your specific goals. The total length of your CoolSculpting sessions will vary depending on the number of areas being treated during one visit. Most people have four sessions in a day, though you may schedule additional sessions in order to meet your goals. CoolSculpting Question: Where does the fat go? Are the results permanent? ANSWER: Once the treated fat cells are crystallized (frozen), your body processes the fat and eliminates these dead cells. Each session removes 20-25% of the fat cells in the treatment area. After your procedure your body will store excessive calories in the remaining fat cells. Therefore careful monitoring of your diet and exercise routine is important to your long term results. If you consume more calories than you burn your body will store fat in the cells remaining after CoolSculpting. CoolSculpting Question: What does it feel like? CoolSculpting Question: Is the CoolSculpting procedure safe? CoolSculpting Question: Are there any side effects? CoolSculpting Question: Can I return to normal activities after my treatment? CoolSculpting Question: When will I see results? CoolSculpting Question: Do I need to take supplements or follow a strict diet and exercise program? ANSWER: No supplements or pills are required. You should closely monitor your diet and exercise habits after your procedure to ensure maximum and long lasting results. All clients are encouraged to maximize the potential benefits of good diet and exercise habits. Excessive calories are always stored as fat some where on the body. CoolSculpting Question: What happens if I gain weight down the road? CoolSculpting® is a non-surgical fat removal procedure that works! Fat cells are systematically removed by chilling the skin of the treatment area to a temperature that removes fat cells without effecting other cells. The result is a decrease of 20-25% of fat cells (results may vary). This non-surgical treatment requires no needles and no anesthetic. Treatment plans vary by individual body composition, lifestyle and goals. Your individual results can vary. Treatment plans usually include between two and eight treatments. A private and free consultation is offered to potential clients to prepare a treatment plan and estimate total costs. The statements made on this website regarding CoolSculpting® Fat Cell Removal results are based upon public clinical studies documenting the procedure. Below are abstracts of some articles documenting CoolSculpting® results. Readers can access full studies on the linked provided to analyze the claims made on this site versus the clinical results. Google® requires this supporting documentation for any claims of treatment efficacy. Lasers Surg Med. 2014 Dec; 46(10): 731–735. A sharply contoured cryolipolysis vacuum applicator was developed to improve fit and tissue draw in the abdomen and flanks to better accommodate a range of body types and a variety of treatment sites. This study was carried out to evaluate the safety and efficacy of the new applicator for treatment of flank fat (“love handles”). A cryolipolysis vacuum applicator with a sharply contoured cup and curved cooling plates was used to treat 20 flanks. Two treatment cycles were delivered sequentially to each flank (60-minute cycle at a Cooling Intensity Factor of 41.6). Efficacy was evaluated 12 weeks post-treatment by physicians performing blinded, independent review of clinical photographs. Safety was assessed by the treating physician monitoring subjects for side effects and adverse events. Four blinded, independent physician reviewers properly identified the pre- and post-treatment photographs 94.4% of the time. Improvement was scored from 0 (none) to 10 (complete) and showed an average 4.3 point (43%) improvement. Side-effects were limited to erythema, edema, bruising, and numbness or tingling at the treatment site, and resolved without treatment. Multiple treatment cycles from a new improved-fit cryolipolysis applicator are safe and effective for reduction of flank fat bulges. A high degree of improvement was reported by blinded, physician evaluation of standardized photographs. Laser Surg. Med. 46:731–735, 2014. © 2014 The Authors. Lasers in Surgery and Medicine published by Wiley Periodicals, Inc.
Semin Cutan Med Surg. 2009 Dec;28(4):244-9. doi: 10.1016/j.sder.2009.11.004. Cryolipolysis for reduction of excess adipose tissue. Nelson AA1, Wasserman D, Avram MM. Division of Dermatology, UCLA Medical Center, Los Angeles, CA, USA. Controlled cold exposure has long been reported to be a cause of panniculitis in cases such as popsicle panniculitis. Cryolipolysis is a new technology that uses cold exposure, or energy extraction, to result in localized panniculitis and modulation of fat. Presently, the Zeltiq cryolipolysis device is FDA cleared for skin cooling, as well as various other indications, but not for lipolysis. There is, however, a pending premarket notification for noninvasive fat layer reduction. Initial animal and human studies have demonstrated significant reductions in the superficial fat layer thickness, ranging from 20% to 80%, following a single cryolipolysis treatment. The decrease in fat thickness occurs gradually over the first 3 months following treatment, and is most pronounced in patients with limited, discrete fat bulges. Erythema of the skin, bruising, and temporary numbness at the treatment site are commonly observed following treatment with the device, though these effects largely resolve in approximately 1 week. To date, there have been no reports of scarring, ulceration, or alterations in blood lipid or liver function profiles. Cryolipolysis is a new, noninvasive treatment option that may be of benefit in the treatment of excess adipose tissue. Lasers Surg Med. 2009 Dec;41(10):703-8. doi: 10.1002/lsm.20864. Cryolipolysis for subcutaneous fat layer reduction. Lasers Surg Med. 2012 Jul;44(5):436. Cryolipolysis is a unique non-invasive method for the selective reduction of fat cells with controlled, localized cooling. It is important, therefore, to understand the potential efficacy and safety of this new procedure for fat layer reduction. A review of the literature associated with cryolipolysis was performed to evaluate the findings from pre-clinical and clinical studies with respect to the mechanism of action, efficacy, and safety. Cryolipolysis has demonstrated efficacy in both human and animal studies. Histology findings also confirm the selective reduction of fat in both humans and animals, with evidence of a gradual thinning of the fat layer over a period of two to four months. Importantly, cryolipolysis has not produced any significant adverse side effects in studies to date and any noted effects have been minor and temporary. Although the mechanism of action for cryolipolysis is not yet completely understood, the efficacy and safety of this non-invasive procedure for fat layer reduction has been demonstrated in the studies available to data. Further studies willl assist in identifying the mechanism and elucidate the full potential of this technology to perform safe, non-invasive fat reduction for areas of local fat accumulation. Dermatol Surg. 2009 Oct;35(10):1462-70. doi: 10.1111/j.1524-4725.2009.01259.x. Epub 2009 Jul 13. Zelickson B1, Egbert BM, Preciado J, Allison J, Springer K, Rhoades RW, Manstein D.
Liposuction is one of the most frequently performed cosmetic procedures in the United States, but its cost and downtime has led to the development of noninvasive approaches for adipose tissue reduction. To determine whether noninvasive controlled and selective destruction of fat cells (Cryolipolysis) can selectively damage subcutaneous fat without causing damage to the overlying skin or rise in lipid levels. Three Yucatan pigs underwent Cryolipolysis at 22 sites: 20 at cooling intensity factor (CIF) index 24.5 (-43.8 mW/cm(2)), one at CIF 24.9 (-44.7 mW/cm(2)), and one at CIF 25.4 (-45.6 mW/cm(2)). Treated areas were evaluated using photography, ultrasound, and gross and microscopic pathology. Lipids were at various times points. One additional pig underwent Cryolipolysis at various days before euthanasia. The treatments resulted in a significant reduction in the superficial fat layer without damage to the overlying skin. An inflammatory response triggered by cold-induced apoptosis of adipocytes preceded the reduction in the fat layer. Evaluation of lipids over a 3-month period following treatment demonstrated that cholesterol and triglyceride values remained normal. Cryolipolysis is worthy of further study because it has been shown to significantly decrease subcutaneous fat and change body contour without causing damage to the overlying skin and surrounding structures or deleterious changes in blood lipids. Dermatol Surg. 2013 Aug;39(8):1209-16. doi: 10.1111/dsu.12238. Epub 2013 May 2. Safety, tolerance, and patient satisfaction with noninvasive cryolipolysis. Dierickx CC1, Mazer JM, Sand M, Koenig S, Arigon V.
Comprehensive assessment of safety, tolerance, and patient satisfaction has not been established from noninvasive body contouring techniques, such as low-level laser therapy, ultrasound, radiofrequency, and infrared light, for reduction of subcutaneous fat. This multicenter study investigated the clinical outcomes of noninvasive cryolipolysis in European subjects. A retrospective study was performed at clinical sites in Belgium and France. Safety was assessed according to reports of side effects. Tolerance was evaluated according to pain scores and patient perception of treatment duration. Clinical outcomes were assessed according to patient surveys, caliper measurements, and assessment of photographs. The investigators treated 518 patients. No significant side effects or adverse events were reported. The procedure was well-tolerated, with 89% of respondents reporting a positive perception of treatment duration and 96% reporting minimal to tolerable discomfort. Survey results demonstrated 73% patient satisfaction and that 82% of patients would recommend the cryolipolysis procedure to a friend. Caliper measurements demonstrated 23% reduction in fat layer thickness at 3 months. Abdomen, back, and flank treatment sites were most effective, with 86% of subjects showing improvement per investigator assessment. With proper patient selection, cryolipolysis is a safe, well-tolerated, and effective treatment method for reduction of subcutaneous fat.